The most efficient way to lay sod is for one or two people to stay on the ground on hands and knees, fitting the sod together. Meanwhile, the rest of the group will drop the rolls of sod in the line about every five feet. It goes really fast! As soon as you can, start to water. A lot of water is required in the beginning to saturate the ground. You will have to maintain that level of water to keep the sod from shrinking! Test the soil after you have been watering for a day or so. 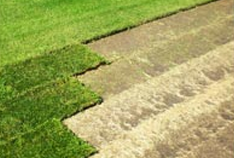 Gently walk out a little way onto the grass and peel back a corner of a piece of sod. You should be able to stick your index finger into the mud up to your third knuckle. If you have that much mud underneath then you are doing a good job! 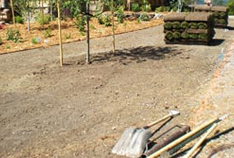 Remember to lay your sod within 24 hours after you've got it home. Sod is extremely perishable! Check out our community connections! In two weeks, your lawn will look like it has always been there! Call today to order your new lawn. All images and content on this website and all associated pages © 2017 Springhill Sod Farms, Bozeman, Montana.